When Rupert Murdoch enlisted Roger Ailes to launch a cable news network in 1996, American politics and media changed forever. 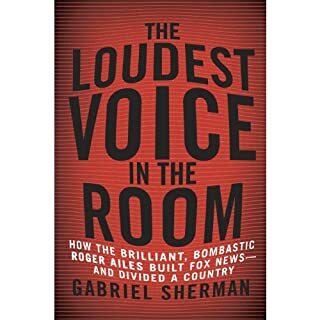 Now, with a remarkable level of detail and insight, New York magazine reporter Gabriel Sherman brings Ailes’s unique genius to life, along with the outsize personalities - Bill O’Reilly, Sean Hannity, Megyn Kelly, Sarah Palin, Karl Rove, Glenn Beck, Mike Huckabee, and others - who have helped Fox News play a defining role in the great social and political controversies of the past two decades. In this incisive, personal account, David Brock disarms the major tentacles of the Republican Leviathan: the Koch Brothers, the Clinton haters, and the Fox noise machine. 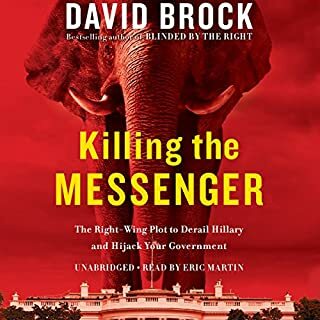 With the acumen of a seasoned political player, Brock takes listeners inside his Democratic war rooms and their 24/7 battles with right-wing forces for control of the story lines and messages that will decide the 2016 election. And he chronicles his own evolution from lead Clinton attack dog to one of Hillary Clinton's fiercest defenders as he knocks down the conservative case against her. Audio version differs from the First Edition: September 2015 print version. Former right-wing journalist David Brock uses his keen understanding and experience to show how a conservative media has skewed American politics noticeably to the right. Brock's incisive analysis of right-wing media theories, strategies, financing, and operations makes for a convincing argument that the Republican Right does not embrace or encourage journalistic freedom, but instead seeks to control it. With billions of dollars to spend and a readiness to demonize dissenting voices, combined with trends toward media consolidation as well as deregulation of the airwaves, the conservative media machine possesses the tools needed to shape the national consciousness. This book is only for political junkies. If you are not a real junkie, then start with Al Franken's Lies and the Lying Liars. The topic is similar and Al's is as serious but is shorter and funny too. 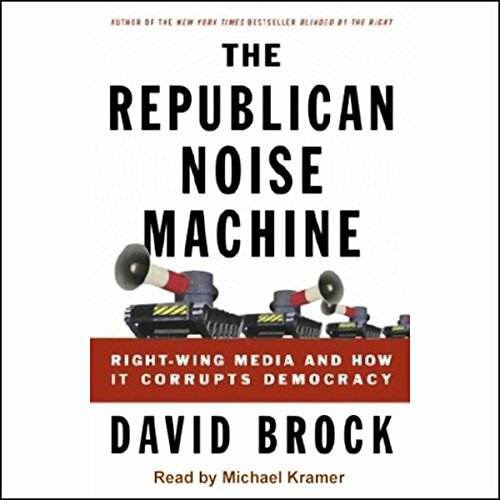 Mr Brock starts the book off with a nice 10 minute summary and then for the next 14 hours, explains how the Republican Noise Machine works. One of his first examples explains how President Nixon wanted to start the rumor that the media had a liberal bias. 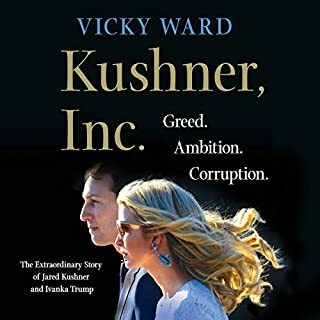 His slush fund was used to make a badly written book, that stated that the media had a liberal bias, be on the best sellers list. He quotes many studies that say there never was a liberal bias, in fact the opposite. But if the Noise Machine keeps saying anything enough, people believe it. He continues with names and examples and examples of how this Machine works to dominate every aspect of our lives. Using a billion dollars, they support 1000's of writers, think tanks, talk radio shows, papers, magazines, Web sites and cable networks to get the Republican talking points heard. They start by supporting conservative college papers and hire the writers and pay them well, to work at their conservative think tanks and publish articles based on the Republican talking points. Truth is NOT required. Vast Right Wing Conspiracy is an understatement. When I purchased the book from audible, it had a 1 star rating. On Amazon the book has all 4 and 5 star ratings, except for one, 1 star rating. 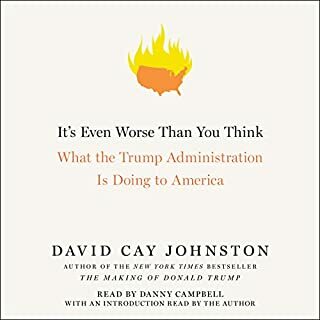 If you look at the user that gave the book a one star rating, you'll see he also gave Blinded by the Right, all Michael Moore's and Al Franken's books a 1 start rating. And funny, ANN COULTER books got a good rating. Want to bet that the people who rated this book so far, didn't really read it. Rather than refute this author, the facts are easily checked. David was an insider and knows that anything slightly left of extreme right is automatically considered liberal and will be attacked by the republican noise machine. David knows that a large part of America does it's best to tune the media out because of the constant color commentary, feeding it's own ego, and patting itself on the back. 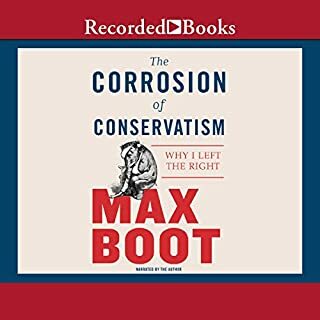 This book explains how the machine works and who the interconnected players are, (which may surprise some) by a person who was disconnected from the Right Wing Machine for being too journalistically accurate and irrefutably correct. Become amazed, It will put a smile on your face. unlike other books that are critical of today's media, this book by Brock provides a fascinating perspective on the historical evolution of the current situation throughout the 60's-70's-80's-90's. FASCINATING. the reader is also first-rate, making this book compelling to listen to from start to finish. HIGHLY RECOMMENDED. A difficult book to hear rather than read for two reasons. First and formost, there's so much data and so many names, not being able to underline, highlite or skim back over previous pages is a genuine handicap. Secondly, the reader reads everything with a kind of smirking, sarcastic tone that doesn't really appear to be called for by the text. With political nonfiction, I want to be sure I'm being convinced by the quality of the argument, not the tone of the voice -- and I'm someone generally inclined to side on the left. I love hearing insiders reports. He's got lots of facts because he lived the life. How much more can you ask from a writer than that?The is a great writer with loads of insight for those that truly want to evaluate both sides of the story. Highly recommended. i'm listening to this well- written volume 14 years after its publication and it feels like I'm opening a time capsule. the author soes an excellent job tracing the origins of right wing media to several economics think tanks who decided to merge corporate interests with social values (reactionary responses to affirmative action, feminism, homosexuality), creating a target audience--a victimized class that exists in a media bubble of spoon-fed propaganda. fast forward 12 years and voilla, you get president Trump. i'm also reading works by Amy Chua which talk about political tribalism, how entrenched political identities lead to stereotyping people outside ones group. thanks for the social fragmentation faux news. This is a scary book in some ways. 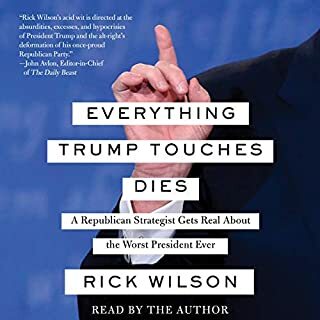 It goes into great detail, on how the republican party, since the time of Nixon has been working on undermining truthful and critical reporting on their party. How they have slowly been infiltrating the media and undermining truthful reporting and discouraging critical thinking, but pushing sensationalist headlines and stories. I highly recommend it. If you want to know what has happened to corrupt our government, our way of life, our love of truth and freedom, read this book. This is one of the most important books ever written. It is all facts--no B.S. David Brock comes from a community that spews lies for the apparent purpose of bringing down our great country. He knows what he's talking about. The reading leaves a little to be desired. It's monotonous and at times difficult to follow. Brock wrote this book for someone who has never been to the United States and never been exposed to the media in America. This is definately a work of fiction. Brock is hoping that the average listener is a complete idiot. Only an idiot would beleive that the New York Times, Washington Post, Time, Newsweek, ABC News, CBS News, and NBC News could ever be considered conservative. Use your book credit for a better book or waste it (and 15 hours of your life) on this book. This should not be listed under the patriotic works. This is more leftist extremist for those who dislike their own country and use literature for attacks on those who try to make it better.